Khwaju Kermani, whose full name is Abul-Ata Kamal-al-Din Mahmud b. Ali b. Mahmud Morshedi (1280–1352), was a famous Persian poet and Sufi mystic from Persia. He was born in Kerman. His nickname Khwaju is a diminutive of the Persian word Khwaja which he uses as his poetic penname. This title points to descent from a family of high social status. The nisba (name title) Morshedi indicates his association with the Persian Sufi master Shaykh Abu Eshaq Kazeruni, the founder of the Morshediyya order. When he was young, he visited Egypt, Syria, Jerusalem and Iraq. He also performed the Hajj in Mecca. One purpose of his travel is said to have been education and meeting with scholars of other lands. He composed one his best known work Homay o Homayun in Baghdad. 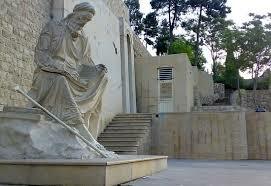 27 Returning to Iranian lands in 1335, he strove to find a position as a court poet by dedicating poems to the rulers of his time, such as the Mozaffarid and Inju dynasty (1318-1393 AD). The tomb of the poet is encased in a protective glass to shield from the elements in Shiraz. Khwaju‘s Tomb is located in north of Shiraz, on the Sabooy hillside and Shiraz-Isfahan road in the narrow Allahu Akbar Gorge. His grave overlooks the Quran Gate. Roknabad famous spring water also passes near the tomb of Khwaju. The tomb was built with the Funding Department of Culture of Fars in 1315 Solar. Tomb‘s building does not have the roof. Its headstone is in the middle of the platform that its above is convex and has a bulge. There is not an Inscription that represents the Khwaju grave. Only on stone a sentence from Quran is written.